Technically, time travel has always been possible! Linking books allow faster-than-light transportation, which is equivalent to time travel given a certain frame of reference. Of course, writing a new link into the past of your own Age (or rather, a quantum state indistinguishable from it), seems like it would require the kind of extremely fine control that only Yeesha has mastered. Linking books allow faster-than-light transportation, which is equivalent to time travel given a certain frame of reference. Yeah, it definitely sounds like it. Wait... So Bahros can basically fastforward and rewind Time itself, and somehow use it to change climate and geothermal activities in any Age in the blink of an eye ? On top of being able to Link at will ? Golly. We're lucky they are somehow restrained by who knows what ! ... Oh wait, they are freed ? And at war ? And some guy gave them the Tablet instead of destroying it ? Oh good. Yeesha, please keep your speeches about Bahros being nice and all to yourself. Don't say I didn't warn you when they decide to Write us out of existence and half the universe with it ! In light of the D'ni's knowledge of quantum theory as the mechanical basis for the "art" of writing “linking books,” it's very interesting that Zandi at the cleft is reading a book about quantum theory / mechanics. I just wouldn't have figured "him" for that. Well, that or Snow Crash. The Art would transport you across your universe if you happened to Write an Age that existed in the same universe as you. However given the nature of the Great Tree that possibility would be very very very small. There has always been a factor of time travel when it comes to the Art in the sense that you Link to an Age that could exist 20 million years from now or 20 million years in the past. Of course this would likely be in a separate branch of the tree given my above commentary on the rarity of Linking to an Age that already exists in our universe. On the cover of Zandi's book it seem it is about multi universes and inside about writing style. Ah, a fair point, I hadn't thought of playing ping-pong between Ages, so to speak. However now that I think about it, there is another issue that needs to be taken into account: you can't physically write a Link that transports you that far. The initial Link in the Descriptive book can end up anywhere, but ultimately, writing more Linking books require you to actually travel to the destination point and write them there. Like, we could write a Linking book to Earth's moon, but not much farther. So while faster-than-light transportation is theoretically possible, in practice it's unlikely to ever happen. Well, the Bahro might be able to do it though. Even assuming you're very very lucky and create a Book to your own universe, would that even work ? Regular Linking books can't link to the same Age you are in, right ? It's unclear whether that limit applies to the whole universe or simply the same planet. In the film Jonathan Livingston Seagull it said (proposed) that "thought" can be faster than light. Btw, I believe that karma is a quality of infinity. I’d argue that Linking Books work regardless of where they’re written, they appear to latch on the closest major gravity well (otherwise a link to Earth would leave you floating in space most of the times). It makes sense that Linking Books were developed before Descriptive Books, or experimenting with the Skill would’ve been... rather difficult. Maybe in the beginning they used wormholes, or were helped by the bahro. In any case, there are clues that Linking Books can be written without the physical presence of a corresponding Descriptive Book. Now, inter-Age linking is possible if you include Yeesha’s style of writing. Normally it wouldn’t be possible, however the same universe in a very distant time (either in the past or the future) might count as a separate Age. Why is this thread in the Spoiler-free section? 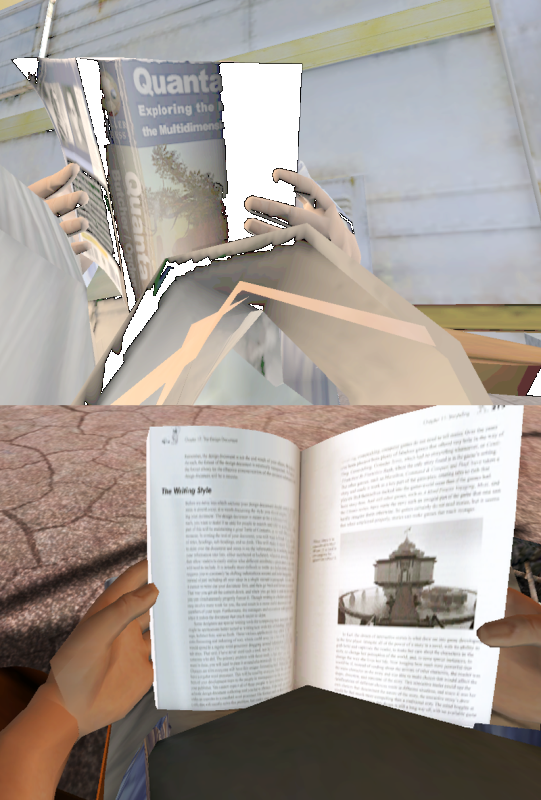 Given the nature of the Art and how Linking books describe specific locations it would make more sense if the Link latched on to the group of objects near the destination, but Ahnonay and Gahreesen prove it's not possible, so I guess gravity is the best bet. It makes sense that Linking Books were developed before Descriptive Books, or experimenting with the Skill would’ve been... rather difficult. Another brain melter if you ask me... You can't use a Linking Book to the same Age, yet Descriptive Books are essentially prisons without Linking Books back to your home Age. Looks a lot like the chicken and egg situation.